Art Cahoon, chairman and CEO of Nakota Development Company, conducts the ribbon-cutting ceremony at his company’s firstValue Place franchise. Joining Cahoon are (from left): Roxy Raymond, Administrator of the Supported Employment Program of the North Dakota Department of Human Services’ Vocational Rehabilitation Program, representing the Williston Chamber of Commerce; Value Place COO Kyle Rogg and CEO Dan Weber; Tom Rolfstad, Executive Director/Director of Economic Development, City of Williston; and Chamber of Commerce representatives Richard M. “Rick” Braaten, Senior Vice President/Chief Lending Officer for American State Bank and Trust Company; Fran Zerr, Customer Service Specialist with the North Dakota Job Service’s Williston office; and Lauren Furlong, Occupational Health Coordinator with Fairlight Medical Center. WILLISTON, N.D. (October 23, 2012) – Nakota Development Company, a full-service real estate development and management company based in Jacksonville, Fla., officially opened its first Value Place location here. Nakota Chairman/CEO Art Cahoon officiated a Sept. 25 grand opening ceremony attended by Value Place corporate executives, staff of the new property and representatives of the Williston Chamber of Commerce. The new two-building property is the first of multiple economy extended-stay sites that Nakota, a Value Place franchisee, plans to open in North Dakota’s Bakken region. Cahoon approached Value Place about developing the region after observing companies flocking to North Dakota to participate in oil exploration. He found Value Place’s affordable extended-stay concept, combined with its franchise program, to be the best model to answer growing demand for temporary housing and facilitate expansion in the market. The new Williston property will not only cater to those involved in energy exploration. Value Place is the perfect fit for any individuals, “away teams” or families who need affordable, long-term lodging. CEO Dan Weber said high demand from such individuals exists in markets throughout the United States, and Value Place is looking for more sophisticated partners like Cahoon to develop properties to accommodate them. 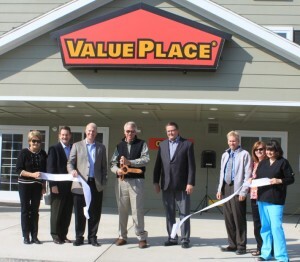 Value Place Debuts Franchise Property in Williston, N.D.
Value Place has franchise opportunities available throughout the United States to qualifying investors. For more information, call (316) 630-5505, or visit ValuePlaceFranchise.com. For more information on Nakota Development contact President/COO Don Nickell at dnickell@nakotadevelopment.com or call (701) 580-1873. Nakota Development Company (NDC) creates a rewarding real estate development experience for its clients. The company’s project management, development, property management and leasing methods are underscored by a friendly hands-on, proactive, team approach. This philosophy enables NDC to be a partner who understands clients’ objectives to optimize results. The NDC team’s expertise and experience includes a broad range of real estate and construction ventures, including hospitality, office, tesidential, retail, sports/entertainment and multi-use projects. NDC prides itself on its ability to not only meet but exceed the expectations of its clients. For more information visit www.nakotadevelopment.com.